James Luccock. Picture by Ian Warde. Never a happy hunting ground for North Shields, Norton and Stockton Ancients’ Station Road home turned out to be a most welcoming venue in an enthralling encounter. The Shieldsmen delighted their sizeable support by going nap, after twice having their lead pulled back by their gallant hosts. Graham Fenton’s lads stormed ahead as early as the second minute with central defender David Coulson on target, burying a delicious Michael McKeown cross with aplomb. The FA Vase winners looked rampant, oozing passion and the livewire Dean Holmes, almost back to his brilliant best, was close to another before on 21 minutes Jack Walker swung over another sweet cross that Dan Walker superbly nodded in at the far post. Norton’s French recruit brought his side back into the contest out of the blue as Charmey’s long range effort eluded Chris Bannon. Slack defending soon brought about another home boost, credited to Pennell, and it was all square. The half ended in some controversy as home full back Morley brought down Holmes with a horrendous tackle only inches outside the box. 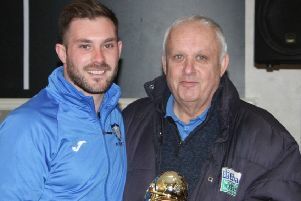 Shields stormed around the Teessiders’ goal as the second half unwound and eventually were rewarded as Dan Wilson’s deflected effort swept past the home custodian. On the hour though and it was 3-3 with an apparent handling offence noticed only by the referee resulting in a spot kick, converted by Poole. It was now nip and tuck, great fare for the neutral, but the Shieldsmen were to finally triumph in style as Gary Ormston nodded in Ben Richardson’s corner before James Luccock made it game set and match with a sublime finish. North Shields: Bannon, Walker, Grey (Donnison), McKeown (Ormston), Parker, Coulson, Luccock, Forster (McGorrigan), Wilson, Richardson, Holmes. Subs not used: Pounder, Carr.